Chikako Yamashiro, Mud man (1-channel version), 2017. High-definition video, 25’30”. In cooperation with Aichi Triennale © Chikako Yamashiro, Courtesy of Yumiko Chiba Associates. In her new series for Roman Road Journal, Philomena Epps explores various facets of contemporary performance and video art by women artists through the lens of current exhibitions. In her first instalment, Epps examines how artists have used the political formulation of the female body as a subversive force, focusing on recent work by Chikako Yamashiro currently on view at White Rainbow. Shapeshifter, a solo exhibition of work by Chikako Yamashiro, inaugurates White Rainbow’s new programme of exhibitions and projects, organised in order to cast light on emerging and mid-career contemporary Japanese artists. Much of Yamashiro’s work has approached the reality of living in the Pacific island of Okinawa, a Japanese prefecture comprising over one hundred islands in the East China Sea between Taiwan and Japan. Despite its current characterisation as a tropical paradise and holiday destination, Okinawa was also the site of multiple bloody and violent battles during WWII, the most significant being the Battle of Okinawa in which 180,000 soldiers invaded the island. Okinawa remained under US administration until 1972, and the presence of American military bases still occupies much of the land today. 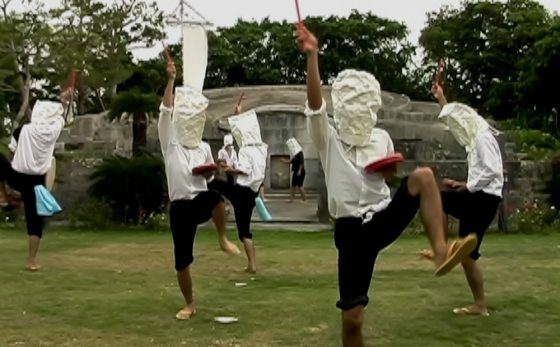 Yamashiro utilises the medium of performance and video, and her own physical form, as a means to both dramatise and unpick this particular aspect of Okinawa’s history and current reality. The notion of the body, often used as raw artistic material, has been central to questioning facets of identity and its relationship to cultural or socio-political structures. Yamashiro’s exhibition opens up ideas about how certain bodies are historicised, intersect with modes of protest or resistance, or critique or rupture the contemporary moment. Can, or how, does the singular, subjective body represent the body politic, or move towards giving corporeal form to objective truth or reality? The exhibition includes videos of three short performances—Trip to Japan; Graveyard Eisa; I Like Okinawa Sweet—all grouped within the OKINAWA TOURIST (2004) series. As Isabella Maidment writes in the publication that accompanies the show, “Okinawa is widely billed as ‘a tropical paradise’, the heart of an idyllic white sand archipelago … to which millions of tourists flock each year … [however] to this day the island plays host to several thousand US military personnel stationed at 32 military bases, amounting to almost one third of its land mass. The particularities of this conflicted island are central to Yamashiro’s work, which strategically addresses Okinawa’s dual status as both a tropical holiday destination and as home to a substantial US military presence.”[i] After 9/11, the tourism board went into promotional overdrive trying to counter the concern that Okinawa would be a key destination to attack. The title, OKINAWA TOURIST, is drawn directly from the name of a tourism group on the island, and Yamashiro’s sequences deploy parody and cliché in order to ridicule these particularities and conflicts. Chikako Yamashiro, I Like Okinawa Sweet, 2004. Video, 7’30″ © Chikako Yamashiro, Courtesy of Yumiko Chiba Associates. Akin to the licentious ‘Bad Girl’ image advocated by certain female artists in the early 1990s as a means to disrupt patriarchal authority, Yamashiro’s use of humour belies a deeper critical engagement. In her 1997 ‘Bad Girls?’ essay, Katy Deepwell expands on this notion of a joke being a fundamentally ideological proposition: “in order to laugh one has to be able to recognise what one is laughing at. The very process of laughter, the recognition of a knowing irony depends upon naming and knowing the position adopted by the joke.”[ii] In I Like Okinawa Sweet, Yamashiro subverts the proverbial image associated with a leisurely summer holiday: the ice cream cone. In an action akin to bingeing or force-feeding, Yamashiro approaches the dripping double-stacked ice cream with gusto, with sloppy, extended licks of the tongue, her cheeks swelling under the large bites. The exaggerated pastiche of tourism jars with her surrounding environment. Lent against the steel wire of the US military fence, Yamashiro is literally and physically framed by the reality of the armed forces, and the potential for war, violence, conflict. The audio of the video is overlaid with the displaced, colloquial chatter of an American radio DJ, which in turn becomes both asinine and surreal. Chikako Yamashiro, The Graveyard Eisa, 2004. Video, 6’50″ © Chikako Yamashiro, Courtesy of Yumiko Chiba Associates. Yamashiro’s Graveyard Eisa, in which dancers engage in the traditional ‘Eisa’ dance, criticises how the performance of cultural practices for the tourist gaze, and its endless repetition, removes it from any authentic context, and moves towards spectacle. In Trip to Japan, Yamashiro stands outside Tokyo’s National Diet Building, holding a placard of Okinawan ‘kikkobaka’ tombstones above her head, in the guise of the political protester. Like Andrea Fraser’s appropriation of facts about Philadelphia, the video’s voiceover both mimics and directly draws from the benign rhetoric of tourism, with a series of monotonous facts about the island on loop. As in I Like Okinawa Sweet, the antithesis is found in the sharp contrast between setting and soundtrack. There is a disjuncture between the reality of Okinawa and the fantasy image portrayed through the voiceover. The symbol of the placard, too, aligns Yamashiro with an artist like Sharon Hayes, who often appropriates protest slogans from historical demonstrations, and introduces them to current and contemporary public contexts. 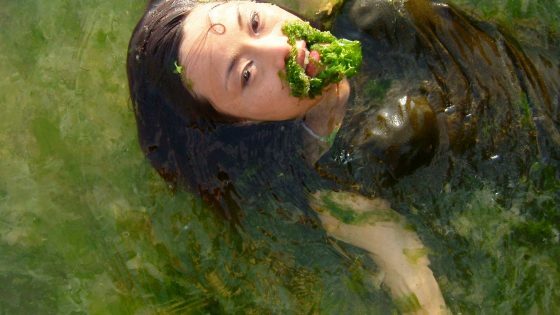 Chikako Yamashiro, Seaweed Woman, 2008. Video, 7’15″ and set of 8 Lambda prints, 28x50cm each © Chikako Yamashiro, Courtesy of Yumiko Chiba Associates. Other works, like Seaweed Woman (2008) and Mud Man (2016), represent Yamashiro’s ongoing interest in the natural world—the water of the ocean or the soil of the earth—as a metaphor for the political body of Okinawa. Seaweed Woman incorporates a short film and a photographic series, shot in the sea off the coast of Henoko. This area was known for its blue coral, but the natural land was recently built over in order to construct a new American military base. Yamashiro floats in the water at various states of submersion, the green weeds covering her face and hair, akin to a mythological creature. In the film, we see Yamashiro stutter and gasp for air, dramatizing the suffocating effects of military presence, and the violence enacted on the destruction of the reef. Mud Man—a more recent work—marks a shift in Yamashiro’s practice, using other subjects as opposed to her own body. Filmed in both Okinawa and Jeju, South Korea, it involves male and female protagonists, and mixes both the Japanese and Korean language. 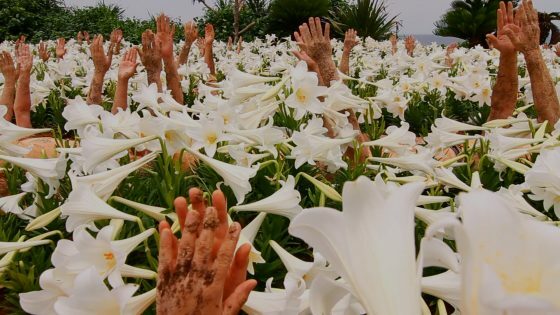 In one particularly striking scene, pairs of open hands begin to burst through the ground, akin to plants in bloom. Symbolic value is placed on the soil: the earth read as flesh. 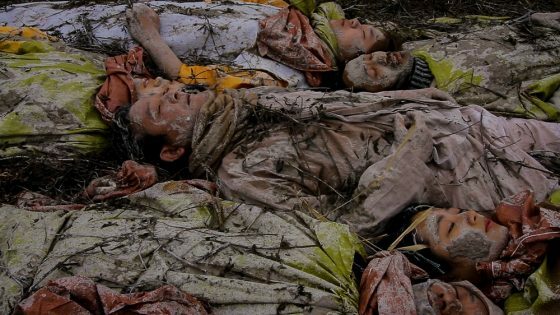 Through using her own body as artistic material—or, as with Mud Man, directing the bodies of others—the boundaries between being an autonomous subject and representing oneself as an object of the wider cultural sphere become blurred. Similarly, throughout the history of twentieth century performance, the subjectivity of the body has been considered through the lens of power, politics and history. The notion of the body as the emblem of the state, an institution, or even a tourist commodity, means it holds the subversive potential to become a provocative site for social rupture, through humour, critique or mythology. Chikako Yamashiro is at White Rainbow until 28 April 2018. Read more here. Philomena Epps is an independent writer and art critic based in London. Her writing has been published by Apollo Magazine, Art Agenda, ArtAsiaPacific, ArtForum, Art in America, Elephant, Frieze, MAP, The White Review, and more. She is also the founding editor and publisher of Orlando.